With the new Link Monsoon ECU you have all the repower capabilities of the Atom plus an onboard 4 bar map sensor, you can also choose to run some of the following features: Gearshift Control, Launch Control, Anti-lag, VVT Control and Closed Loop Boost Control. 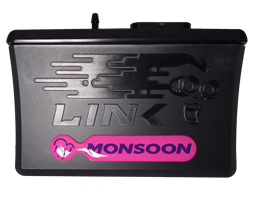 Note: The Monsoon ECU will run any of the above features, but it cannot run them all at once. The amount of features you can run is dependent on how many of the limited Inputs and Outputs each feature needs. The Monsoon is ideal for engines with 4 cylinders or less that just need a repower and one or two features, so you don't need to make the jump up to one of our higher level ECUs.